Welcome to Marvel Strike Force Heroes page. This is the full description of MSF Cable stats, skills and abilities. Cable is a powerful Mutant Blaster who works best with Deadpool. Cable’s first skill inflicts heavy damage and gives him charged status. When charged his second skill can damage targets who are two spaces from the primary target for the moderate amount of damage. In addition, his second skill also reduces Speed Bar of all affected enemies. Cable ultimate delivers enormous damage to the single target and if Deadpool is his ally Cable gain assist from him. On the kill, both Deadpool’s and Cable’s Speed Bar is filled by 30%. Cable also has a passive ability which can provide allies with Counter. This character is very durable for the Blaster but his durability comes at the cost of his speed. 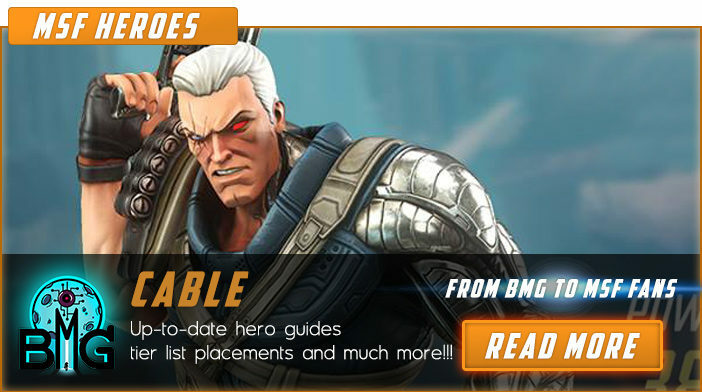 Cable’s price is 45 shards available in Cable Blitz, 1.9 Mystic Campaign mission or Premium Orbs. We hope that you enjoyed the description of MSF Hero Killmonger. For detailed information about other MSF Characters check our MSF Heroes page.